Illuminated manuscript on vellum. – 65 leaves (incompl.). With 7 large historiated initials and border decoration. Benedictine choirbook probably made for S. Pietro Maggiore (OSB) in Florence. This codex presently consists of sixty-five leaves with texts and music from the Common of Saints of an Antiphonal. 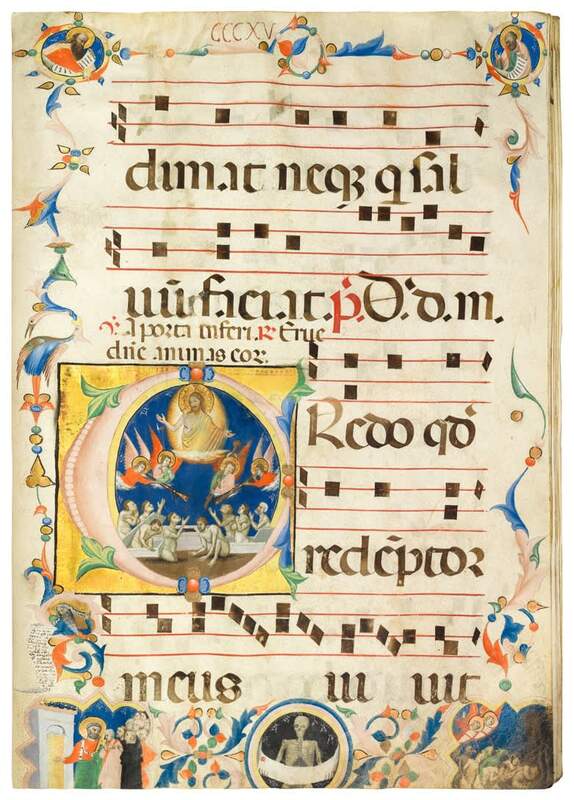 An impressive large-format choir book, however incomplete, it was the first of a series of three books probably created for the Benedictine convent of San Pietro Maggiore in Florence. Thirty companion leaves are known, preserved in La Spezia (Museo Civico Amadeo Lia), in Venice (Fondazione Giorgio Cini), and various private collections. It was the time when Florentine illuminators began to conceive miniatures as reductions of monumental panel painting by creating tangible spaces within the initial, wherein the narration freely developed. Two of the four artists that worked on the whole project added their talents to the present codex. The first, Master A, the more archaic illuminator, distinguishes himself by an artistic language hearkening back to the famous Florentine traditions of Maestro Daddesco and Pacino da Bonaguida, both active c. 1320-1340. He was responsible for painting St. Benedict and a Virgin Saint (f. 253). A second artist painted several of the Virgin Saints (ff. 254, 258, 303), and the Last Judgment. This Master B shows his acquaintance with the more progressive tendencies of Florentine painting of the 1340s. His style displays a remarkable monumentality, while design and execution are of superior finesse. His art is rooted in the work of the Master of the Dominican Effigies (c. 1325-1350), a leading figure amongst Florentine manuscript and panel painters.